The Christmas magic truly arrives in December when all of the Christmas lights come out in decorations seen all around. There is just something about all of the twinkling lights that just give you hope that something amazing is going to happen and they have a way of inspiring me to keep dreaming. When the Christmas lights come out in December, families become closer, people become givers, and friends become family. As much as I don’t love the cold weather, sometimes I wish December would last all year round. My husband took this photo of our Christmas lights last year so I thought I would share it with you all and say welcome, and Hello December and all the goodness that you bring. Cheers and Happy Holidays! May the magic of the lights shine over you. How much stuff can we all actually have or need? As the weather gets warmer, I start to think that all I actually need is a pair of flip flops, a sundress and my aviators. Stick me under the sunlight and I am a happy lady. But in all seriousness, what is it that actually makes us happy? Things? People? Money? For me, it’s my people. 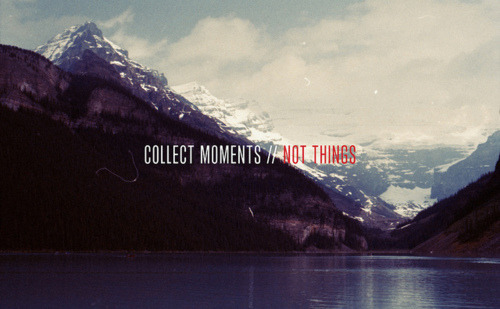 We need to create moments and not collect things. My husband Russell and I have been talking about this a lot lately. He actually sent me an email with a list of things he wants to do less, things he wants to do more and things we can keep the same. I think we were having the same thoughts at the same time, because when he sent that email, I was driving to the dentist having the same exact thoughts! I completely agree to all of these-all in all it will just make us better people. Here’s to the Spring Life Makeover! Thank you hubby for always being so inspiring to me. Shout out to my beautiful cousin-in-law who might as well be my sister! Happy 29th Birthday Ashley and you are 2 months away from being a mom too 🙂 Love you!